Rules of Golf: Which Ball is in Play? "In a strokes competition, a player hits his tee shot in left rough. Goes to look for his ball, not finding after brief search, returns to the tee and hits a second ball into the same area. While looking for the second ball and finding a ball, a spectator advises that the ball he found is in the area where the first ball landed. 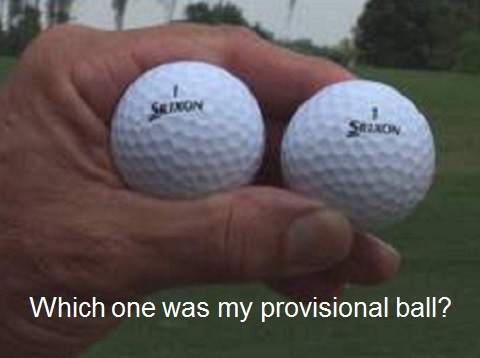 Player cannot determine whether the ball he found is his first or second tee shot as both balls were marked the same. Player plays the ball found through the hole and asks for help in scoring to determine his score for the hole." Initially, I thought that Situation 4 in Decision 27/11 provided the answer to this question (see below for the rulings on four interesting situations relating to a player who cannot distinguish between their original ball and their provisional ball in this Decision), but I have been corrected and I think that it is worth explaining where I went wrong. When a provisional ball is played onto the course there are two possible outcomes; the original ball may be found in bounds, in which case the provisional ball is then out of play, or the original ball is lost, in which case the provisional ball is the ball in play. The mistake that I was making in respect of the above question is that when the player returned to the teeing ground and put another ball in play, (Edit 17th June: which is not permitted to be a provisional ball) the first ball was immediately lost. So, when the player could not distinguish whether the ball that was found by the spectator was his original ball (lost and not in play under the Rules) or the second ball (the ball in play under the Rules), he was not permitted to assume that the found ball was his second ball. Therefore, his only way to proceed within the Rules was to return to the teeing ground and play another ball, his 5th stroke. Failure to do so meant that he was disqualified from the strokes competition, because he did not hole out with the correct ball. Solution 2: As the player's original ball is lost in the water hazard due to his inability to identify it (see analogous Decision 27/10), the player must proceed under Rule 26-1 with respect to the original ball (estimating the spot where the ball last crossed the margin of the hazard, if necessary - see Decision 26-1/17); his next stroke would be his third. Solution 4: One could argue that both balls are lost. However, it would be inequitable to require the player to return to the tee, playing 5, when the player has found both balls but does not know which is the original and which the provisional. Accordingly, the player must select one of the balls, treat it as his provisional ball and abandon the other. Remember that the principle in Situation 4 does not apply to the question at the start of this blog, because no provisional ball was involved. The current series, '9 Questions About ...' will be available at the start of next year. I think the golfer lost his opportunity to hit a provisional once he went forward from the tee box a significant amount to search for his ball. Even if he had declared his second shot provisional, it would not have been. In that case where he declares a provisional, but isn't allowed to, does the second ball become the ball in play? I don't agree with the explanation : ".......when the player returned to the teeing ground and put another ball in play, without announcing it as a provisional ball, the first ball was immediately lost". According R 27-2a going back to the teeing ground ( unless it is < 50 yards Dec. 27-2a/1.5) means that that ball is not a provissional ball and becomes the ball in play. Of course, you are correct. What was I thinking? I have now corrected this facile mistake. Thanks to you and many others who spotted this error for taking the time to advise me. ps Just bought 999 - great ! Phew I thought I was going mad, and was about to leave the same message. Good tip! I have recently started doing this myself. I am pleased to hear that you are finding my '999 Questions' eBook useful. Mea culpa. I am scarlet with embarrassment!